…or an insect that somehow got in while the robot was in training maneuver on Earth soil. “…curiously organic-looking on the edges on the object”, the article said. When you look at the scoop, it appears that it is chipped in one corner, kind of matching the piece of metal. Just a guess. It does kinda look like that doesn’t it! It looks like a sheared-off clip / staple from a cable. Although I like the ‘lost earring’ theory . . . Okay, that’s interesting. I’m assuming in the end it will be innocuous – but it’s certainly weird and merits closer scrutiny. Look closely, is’t chewing gum? maybe it’s a Alien Nano-bot! If only it could turn out to be some kind of Martian bling. I bet that we’d get a manned mission their b4 2035 then! It isn’t the first craft to go to pieces. More seriously, an 8 g shaking would get rid of remaining scrap in the mechanisms. A piece of Mars Climate Orbiter. You Know? There is something just not right with that photo!! It is like a studio type photo; like it is a artificial type of photo from a studio/lab sort of! It does “not” appear real from Mars! The sand is tooooo uniform like it’s been raked, etc! Are we landing everything in the same place? It’s a freaking planet, how lucky could we get that we find our own stuff from years ago? Yes, everything lands in much the same place. All of the mars landers have aimed for the same basin on mars. Although they’ve gotten a lot more accurate about landing over time. No we are not. If it’s from Earth, it’s from Curiosity or it’s landing system. There were some missions years ago, that disappeared off the radar! Was referred to as the Mars curse! Maybe this is a piece of history! I think Transformers live there. NASA sent to Mars exploration ship. move the ship to go low altitude Mars. this ship should be named SRGPORToriGem. vai vai name identifying receive a communication. all the tech on hand JPL and NASA and you can’t tell if that belonged to anything of our probes or rovers? Come on now, isn’t every part on anything we ever sent out to space numbered? I mean every vehicle we send is gone over with a fine tooth comb, is it near any of the crash site of any man made object? That would be my first question. I know you guys probably can magnify that a lot more than what we’re seeing. Does it look like it fell of anything of ours or the Russians. Now those guys sadly to say lost a lot almost all of their vehicles. It’s not a part, it’s a chip, like something chipped off of a part. Unless you expect them to number every single square micrometer of every single part in the thing, no, they’re not numbered. Also, this is Mars, not Earth. Things aren’t mapped out to the point that you can pull up Google Mars Maps, turn on street view, and say “oh, yea, that’s where the probe landed 10 years ago.” You’re right that JPL and NASA have a lot of smart people doing a lot of smart things, do you really think some armchair scientist is going to provide any real insight on something that he thought of in the 3 minutes it took to read the article? If something is 1 light year away then it takes 1 light year to get there and nothing is faster. What if you had a pole long enough to reach a button 1 light year away then pushed it, does that mean the push reaches 1 light year away faster than light can get there? The object has a straight-looking edge on the left-hand side in the photo. This suggests it is a chip off some rover part. 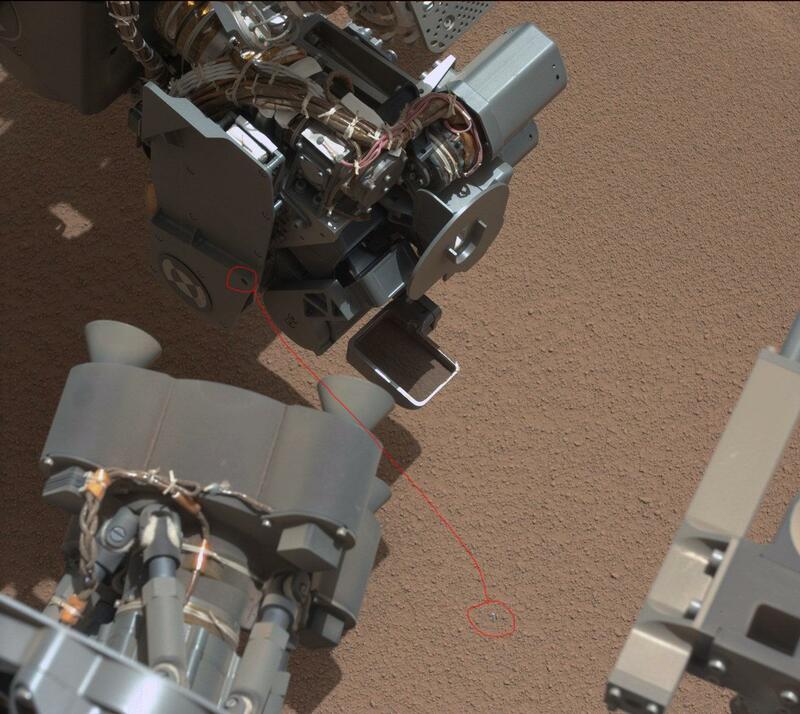 However, for me the most interesting aspect is that Curiosity found this tiny thing on one of its 17 cameras, and it now has a whole set of tools which should reveal what it might be too. One of the arguments for manned missions was that a human on site might pick things that a remote-controlled robot might miss. A few more missions like this, and manned mission proposals might look like old science fiction. There is no rush. Curiosity does not have to breathe, drink, feed, or sleep like a human team. It does not have to plan for the return journey, or suffer the side-effects of reduced gravity and increased radiation. If it dropped this thing, it will probably drop less than a human team would. It can explore for years. And all the time, we get to watch. If we send as much stuff down as we would have needed to for the type of manned team you are talking about we could have landed a dozen or so Curiousity rovers across the surface of the planet. What’s even more amazing is the pathetic manufacturing engineer who forgot to trim the zip ties. Actually, you don’t want to clip the zip ties due to the expansion and contraction of the plastic in space. Going from 80 degrees to -150. So, please learn something before looking like an idiot. That’s the stupidest thing I’ve read today. Don’t clip the zip ties because of expansion? Tensile strength of the zip ties would be specified and the zip ties tightened to a point in order to allow for contraction and expansion. Trimming the zip ties would not present a problem. I’m going right to R.C.H.’s Enterprise Mission website to get the REAL story on this one!!! The push generates a compression wave that travels along the pole. The speed of that wave is the speed of sound within that pole, so it depends on the density of what the pole is made from, but an infinitely dense pole would have a speed of sound equal to the speed of light. tl;dr: the push takes as long to reach the other end at the speed of sound. Yes there seems to be one screw missing but the ChemCam image doesnt look very suggestive of a screw!? Good catch on that missing screw. Wow, so needlessly dramatic and negative. Because the interactions between the atoms that make up the pole are still carried by photons which, as you’ve pointed out, only travel at the speed of light. At first glance and in colour it looked to me like a screw. Seeing the monochrome pic, I’m not sure. h yeah, had to be done. I bet it’s a foil from inside a cigarette pack. I find those everywhere. I thought it was part of a beer can tab? youre an idiot. You might not realize it. But you are. It does’nt look like a screw or anything like one on the ChemCam, it looks more like fabric or like the skin off something, Not that im suggesting it’s from an alien life form, but that’s how it looks to me. oh hell! its a toenail. It looks like Snookie’s fake fingernail… let’s run tests..
“The ChemCam image, although monochrome, reveals some interesting and curiously organic-looking edges on the object… although it could be a bit of something that came loose from the rover itself. Perhaps a bit of plastic wrap or tape from a cable? Or a flake of metal from the back shell? “curiously organic-looking” How can a metal flake look ‘curiously organic’??? Me thinks you ‘see’ what you want to see. And they call this science? i reckon it is a piece of debris from one of the many earlier space craft that broke up on mars re-entry over the past few decades. looks like a piece of the parachute,or a grasshopper skin ??? I am very surprised to see wire bundles exposed to the elements. It looks like there are all kinds of nooks and crannies for dust to clog up!